We had a great discussion about this movement, and we collectively criticized the way it was being reported by the mainstream media. 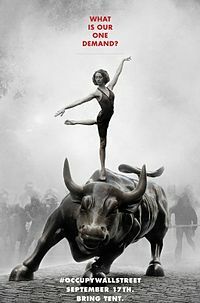 Douglas Rushkoff’s article early on in the protest did I very good job of capturing the essence of the movement and why we can’t compare it to previous historical protests. The mainstream media criticized the movement for it’s lack of focus and multiple and conflicting messages – which was exactly their plan – there was so much to be angry about. The movement was collectively pissed off about any number of things. But mainly the growing disparity in the incomes of the majority (the 99%) and the well heeled 1%. Where has the movement gone? In fact when I looked to update myself today, they were in the news. With more of us packing around smart phones there is much more liklihood that news events of the day are going to be recorded by civilian journalists. In the case of the first Occupy protester, Alexander Arbuckle, on trial for his involvement, it helped him to be equitted as video evidence contradicted the arrest claims. He had nothing to do with it. We have a lot to be concerned with in the world. But thankfully we are concerned from the vantage point of a Canadian, we have it relatively pretty good, and I think that fuels generosity. Today’s Mobile Phone Business Etiquette: Rude or Acceptable?